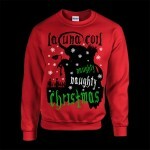 Lacuna Coil have released their own Naughty Christmas Jumper for Coilers to celebrate the festive season in style! The jumper, which is available online through their official merchandise site is available in unisex sizes from S to XXL. You can purchase the jumper from the Backstreet Merch online store here.